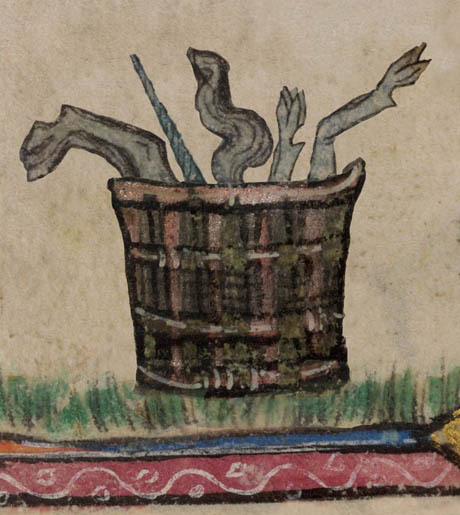 IMAGE: “Detail of a unicorn on the grill,” courtesy the British Library. 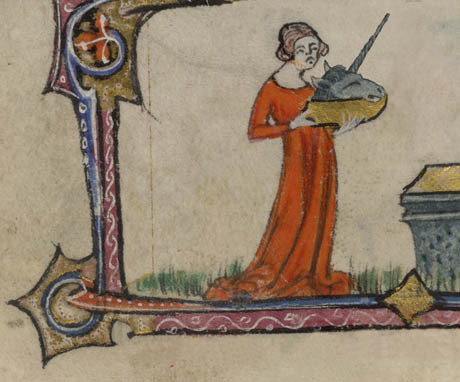 IMAGE: “A lady bringing the unicorn’s head to the table,” courtesy the British Library. Perhaps the most obvious giveaway is the fact that the last thing one would be advised to do upon capturing a mythical beast is marinade it in garlic and cloves, and then spit-roast it. IMAGE: “The remains of the unicorn,” courtesy the British Library. Nonetheless, for its exquisite illustrations alone, Manuscript #142012 deserves a place in the spaghetti harvest pantheon. Well done!